Colden Drystone (b. 1984, London, UK) lives and works in Hastings, UK. Drystone holds a BA in Fine Art from the Chelsea College of Art and Design, London. Recent solo performances include: In The Making performance at Art Brussels, Belgium (2013). 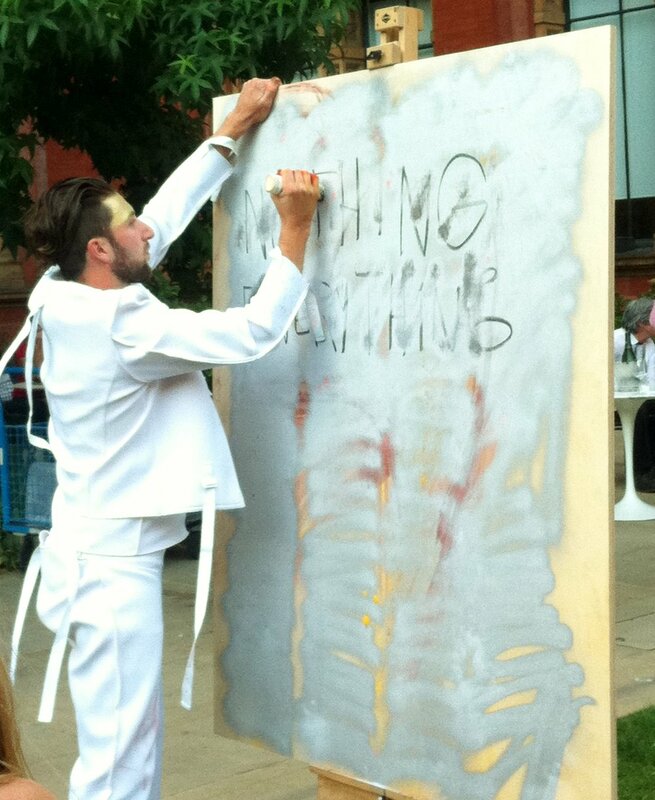 Future Primitive performance The Victoria and Albert Museum, London (2013). Ahead of Time (2016) and You See Me Like a UFO (2017) at Hannah Barry Gallery, London, are amongst his latest major solo exhibitions. Colden Drystone makes performative work. In the studio his everyday performances are recorded through the collage of sculpture, painting, print making and film. He uses clay, pigment, spray paint, mono prints and oils on wood and glass panels. The finished work is a document that describes itself being made and a record of the investigations and decisions the artist experiences in his attempt to create something from nothing. Dates and numbers, words and gestures, images and colours all share the space of either a golden clay ground or a reflective black mirror. Colden then edits these collages in a hunt for meaning and balance. In his live works ideas are embellished with sound and movement. A trained musician, Colden uses piano, guitars, drums, voice, electronics and sampling to write and perform musical ‘versions’ of his studio work. Self referencing is again a factor with some pieces literally describing their own content while other pieces sample live radio and internet footage to use as building blocks for Dada compositions. The performances vary from short, anecdotal sketches that are caught and looped on film to vast multi channel stage pieces that cast other archetypal characters along side Colden. The performances expose Coldens studio routine and offer the audience a chance to see how a work is made. Colden also writes and performs pop music that both influences and is influenced by his studio experiences. Colden has performed at Art Brussels, Belgium, The Victoria and Albert Museum, London, Palazzo Collicola Arti Visive, Italy, Bold Tendencies, London, Copeland Book Market, Stroud and at all his major solo shows to date with the Hannah Barry Gallery, London. Colden was artist in residence for Girton College, Cambridge 2013 - 2014 and a recipient of The Anna Mahler Award in 2013. Colden Drystone lives and works in Hastings.